Nose Bleeds are caused by the bursting of small blood veins located inside the nose which are easily broken by a good pop to the nose. The injury, although sometimes looking horrendous due to the amount of blood which appears to be flowing, is usually quite minor and can occur frequently while playing baseball. A bad bounce, a hard slide or a swipe tag from another player can easily result in an injury. So let’s exam quick First Aid procedures for treating a player. The First thing to do is to stay calm yourself. Depending on the age of the player, they may be crying, horrified by the amount of blood, or just dazed. It’s important you project a feeling of calmness and security. Terms such as “It’s Ok, you’ll be alright,” or “ I’m here to take care of you, don’t worry.” are soothing. It’s usually the coaches’ job to administer the initial First Aid to his player suffering this injury, for a couple of different reasons. He should be more calm than a parent, a player will not want to cry in front of the coach and You are the authority figure on the baseball field, and if you say everything will be fine…everything will be fine. .
Have the player sit down and hold their nostrils with your fingers, or facecloth. 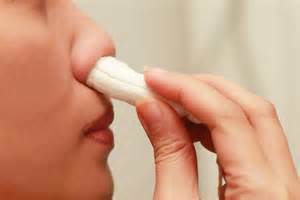 Pinch the flimsy part of the nose between your thumb and forefinger, keeping firm and steady pressure on the nose. In the unlikely event the bleeding can not be stopped, seek medical attention. It is important the player sits up rather than lay down while applying pressure to the nose. The pressure to the nose closes the broken blood veins, stopping the bleeding by coagulation. However, if the player is laying down, the blood pressure is increased to the nose and coagulation becomes more difficult. 1. It appears the player has broken his nose. 2. If the Bleeding Can Not be Stopped. 3. If the Player has trouble breathing. 4. If there appears to be a Foreign object in the nose or nostril. 5. If there is bleeding elsewhere like from the gums or ears. Any blood on the field can be traumatic under the right circumstances, but if you know what you’re doing and take quick decisive action in administering First Aid, the situation will quickly be corrected and the player will have a temporary battle scar to talk about at school. The 2nd most probable injury in Baseball are Sprains and Strains. The ankle is particularly vulnerable to this type of injury and will be our focus, although other body parts such as the wrist can also sustain the same type of injury. An ankle sprain occurs when ligaments surrounding the ankle joint are stretched or torn. This occurs when the ankle is forced into a position which is not normally encountered in everyday usage. The most common cause of an ankle sprain is when weight to the foot is applied while it’s in an inverted or everted position. This usually happens when running or jumping on an uneven surface, such as an outfield, or by slamming into a fixed object, such as an anchored base. The foot rolls in (inversion) or out (eversion) and the ligaments are stretched beyond normal capacity. Occasionally, a bad injury, a loud snap or pop is heard at the time of the injury. This will be followed by pain and swelling of the ankle. Grade I Stretch and / or minor tear of the Ligament without laxity (loosening). Grade II Tear of Ligament plus some laxity. * Elevation. Raise the ankle to a resting position above the hip or heart to help reduce blood flow and swelling in the area. * If swelling does not subside in 48 to 72 hours, seek medical attention. * If you are unable to put weight on the ankle without severe pain within 48 hours, seek medical treatment. After the initial 24 - 48 hours of rest and icing you should be able to slowly start applying weight to the foot. It’s a good idea to utilize crutches in the beginning stages to avoid applying full weight on the injury. Use a normal heel to toe gait as you begin applying weight. Use an ankle brace in order to protect the joint from re-injury should you begin to fall or stumble. Any ankle injury which is not completely healed within 1 - 2 weeks may be more serious than a sprain and you should consult a physician for evaluation.